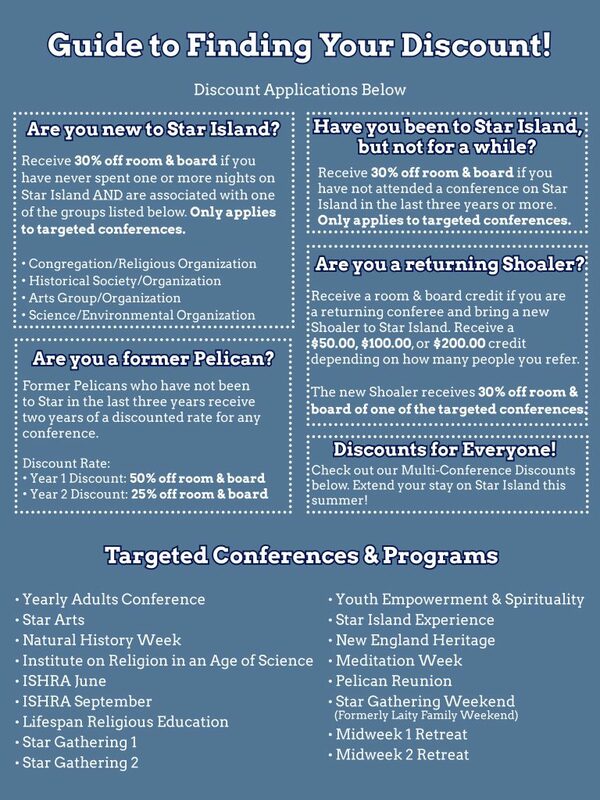 Typically, youth apply for financial aid from both Star Island and the YES fund after registering for the conference. If offered grants from both funds, youth can compare the amounts and may accept the higher amount. ​After making a scholarship decision, we ask that you confirm as soon as possible once an amount has been negotiated so we can estimate funds for others. These are the amounts to keep in mind when applying for financial aid. As mentioned, if you would like to register for our conference, but prefer to not make a deposit upon registration until you know what you can receive, you may email us and we can set this up. Please Note: Our $85 Conference Programming Fee does not factor into Island Room and Board costs, and are not covered by financial aid. Star Island asks for their financial aid by JUNE 1, two weeks before ours is due. Star Island will give you a response by JUNE 15, and you must confirm acceptance by JULY 1. Star Island does not accept late applicants. To apply, you must be registered for a conference because they also need to be able to have a solid estimate of what they will be providing to whom, since their aid applies to all conferences throughout the 2018 summer season. If you would like to apply to star island aid, but cannot/have not registered for whatever reason, you can email us and we can set up a registration without deposit in this instance. The form to apply to Star Island Financial Aid can be found here. Star Island usually provides partial scholarships, but less likely to they provide full scholarships. Still, it is a good idea to apply to both so you can compare and see if either Star Island or we provide an amount you can work with. The YES Conference has between $2500 to $3000 to offer each year, which gets split among all conferees who apply for financial aid. Depending on factors as listed in the application, as well as the determined need of other applicants you may receive partial or full scholarship. Please read through our application prior to submitting, to ensure you have full understanding. Please send us an email to registraroftheyes@gmail.com if you require any assistance in filling out the form. It is our goal, that we make sure all who apply are able to attend our conference no matter what their circumstance. Upon submitting your application, we will review all applications and give you an offer. -If this offer is acceptable, you reply that you accept, and we let you know how much you will owe on island. -If you require more, you let us know you will need more in order to attend, and we continue working out your amount. We ask that all applications are due by JUNE 15, a response will by given by JUNE 25, and a confirmation of acceptance is due JULY 15. You can select our YES Conference financial aid application here. - You can ask for anywhere between $1 and $1608, depending on room type. - You do not need to be registered for a conference to apply for our scholarship. The deadline to apply for discounts is SATURDAY, JULY 21, 2018. You may apply if not registered for a conference yet. Please read through the whole page. You will then be prompted to fill out forms for each discount to see if you qualify. If you do qualify, the discount will be reflected on your final bill. Discounts will only affect your financial aid amounts from YES if your received aid exceeds your final bill. In addition to the financial aid options described above, many YES conferees also receive financial grants from other sources. In the past, these have included local churches, youth groups, high schools, community service grants, or scholarships from regional denominational bodies like the Unitarian Universalist Association or United Church of Christ. Finding such a grant could be as simple as contacting your RE director, youth group leader, or minister, and seeing if any funding exists for community members (and youth in particular) to attend conferences or events. Case in point: the First Unitarian Universalist Society of Middleboro, MA now sponsors one youth each year to attend the YES conference. Many congregational leaders are excited to see youth participating actively in religious or spirituality-based programming!